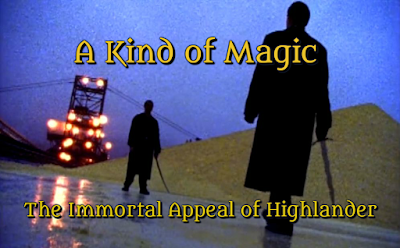 A Kind of Magic: #4: Highlander the Series - "The Gathering"
1992's Highlander: The Series came along at just the right time. After Highlander 2, the franchise (which was only two movies) was in the toilet and even the most passionate fans complained that the sequel had ruined something that was once fresh and cool. Along comes the TV show, which offers what is essentially a soft reboot. The syndicated series ignores the second movie altogether, instead choosing to go back to the things that made the FIRST movie feel so special, albeit with a few tweaks. Gone is any reference to another planet or any hint at alien technology. Gone is the futuristic slant and the high-concept premise. Instead, we return to the time of "The Gathering" when only a few immortals remain and must battle until to the death. The premise is its mantra: in the end, there can be only one. The series plays things close to "real;" the only fantastical elements within the series are the Quickenings that occur when an immortal is slain and a sort of "Spidey Sense" that immortals now have to let them know when another of their kind is around, presumably to prevent ambush. The gritty tone from the first film serves as the template for the series, much to its benefit. The music of Queen and the rock and roll swagger is back. If you can't tell, this was MY Highlander.